The most convenient is to take bus number 7, which stops in front of the station. Tickets can be bought in the station bar. Get off at the second stop on Via Castelnuovo, just after the railway underpass. Continuing in the same direction on foot, take the 1st street on the right (Via Valeggio) then again right after 50 m into Via Anzani. 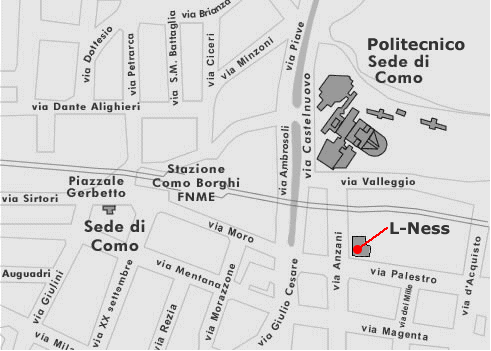 The L-NESS is located on your left side after approximately 100 m.
Exiting from the station, turn left onto Via Aldo Moro, continue up to the intersection with Via Castelnuovo. Carry on straight into Via Palestra then take the first left (Via Anzani). The L-NESS is located at the intersection between Via Anzani and Via Palestro. The closest airports to the L-NESS in Como are Milan Malpensa, Milan Linate, and Bergamo Orio al Serio. Milan Malpensa is served by its own railway station on the North Milan network. Change at Saronno for Como. This makes Malpensa the most convenient airport for reaching Como by public transport. It is also the easiest for those who wish to rent a car. There is a shuttle bus which reaches Milano Centrale railway station in about 30 minutes. 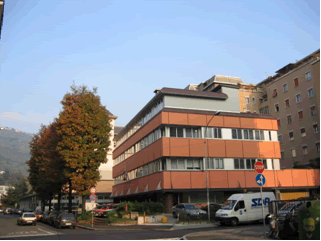 There is a shuttle bus which reaches Milano Centrale railway station in about 60 minutes.